The official release date for Warlords of Draenor (WoD) was Nov. 13, 2014. No there 6.1 patch has landed and a few additional changes were made. The big change, as far as Warriors as concerned, is just the ten levels and the level 100 talents. Warrior tanks will lose their Vengeance, but will get a replacement, so should be fine. Ah yeah, lots of abilities are going away or being consolidated. Arms Warriors, with their new Mastery, should actually feel more like Arms Warriors. Ditto Fury and Prot. So are the changes good? Leave a comment and state your piece. Second Wind now increases Leech by 25% (up from 10%.) I guess no one was taking that talent? Siegebreaker (Arms, Fury) damage and knockback distance has increased by 50%. Slam (Arms) damage has increased by 43%. Improved Defensive Stance now increases armor by 10% (up from 5%). The following changes are not particular to Warriors, everyone is getting them, but they’re still important. Dodge and Parry have been replaced with Bonus Armor. If an item had both Dodge and Parry on it, it has been replaced with an additional useful secondary stat. Readiness: At one point there was a “readiness” stat, which reduced cooldown times. Readiness is now dead. Dual Wielding still imposes a 19% chance to miss, to balance it with two-handed weapon use. Some abilities might cancel this. Unwavering Sentinel now also reduces the chance for attacks to be parried by 3%. All tanking specializations receive a similar ability that provides an additional 3% reduction in chance to be parried. Tank attacks now have a 0% chance to be parried vs. creatures up to 3 levels higher. These boosts will take the form of abilities and will add that 5% once you learn them. Protection: Mastery – via Shield Mastery @ level 90. Each point of Strength now grants 1 Attack Power (down from 2.) All other sources of Attack Power now grant half as much as before. Weapon Damage values on all weapons have been reduced by 50%. Attack Power, Spell Power, or Weapon Damage now affect the entire healing or damage throughput of player spells. Bliz likes the “Active Mitigation” more than the Parry/Dodge model, so they’re going to do away with a lot of that Parry & Dodge. Items in Warlords of Draenor will not have Dodge or Parry on them as a stat. Some Dodge and Parry can still be gained through class-specific effects. The amount of Parry gained per point of Strength has been reduced by 25%. But see Riposte in the Prot. Warrior section, below. For you PvPers, the amount of Dodge provided by Agility is also being decreased. Those pesky Rogues and Ferals will now be that much easier to hit. Yeah, Haste. That stat that most Warriors try hard to get rid of. Bliz tried to make it better for Warriors in Mists, but didn’t succeed. So they’re gong to change it up with a new ability. Haste has long been a problematic stat for Warriors, usually being of little value. As part of our commitment to ensuring all secondary stats are valuable (except Bonus Armor for non-tanks and Spirit for non-healers, of course), we’re making a significant change to Warriors, to ensure that Haste has strong, competitive value. Headlong Rush is a new passive ability for Warrior. Your Haste reduces the global cooldown and the cooldowns of Mortal Strike, Bloodthirst, Shield Slam, and Thunder Clap. For Warriors, Bliz focused on removing abilities that were redundant, and making some tweaks to rotations. Redundant and unnecessary ability have been hacked. Berserker Stance has been removed. Demoralizing Banner has been removed. Skull Banner has been removed. Sudden Death has been removed. Unbridled Wrath has been removed. Not only are a number of abilities being removed, other are being restricted to one or another spec and others are being merged. This should help clean up the action bars and the spell books. Inspiring Presence is a new passive ability for Arms and Fury Warriors which grants 3% Versatility to the Warrior and all allies within 100 yards. Battle Shout now lasts 1 hour and no longer generates Rage. Commanding Shout now lasts 1 hour and no longer generates Rage. Colossus Smash is now Arms only. Deep Wounds is now available only to Protection Warriors. Blood and Thunder’s effects have been merged into baseline Deep Wounds for Protection Warriors. Hamstring now costs 10 Rage and deals 20% weapon damage, in addition to the movement speed slow. Thunder Clap now costs 10 Rage, and also reduces the movement speed of nearby enemies by 50% for 6 sec. Mocking Banner is now available only to Protection Warriors. Rallying Cry is no longer available to Protection Warriors. Shield Wall is now available only to Protection Warriors. Mortal Strike now replaces Heroic Strike for Arms Warriors. Whirlwind is now available only to Arms and Fury Warriors. Recklessness is now available only to Fury and Arms Warriors. Thunder Clap is no longer available to Fury Warriors. Rallying Cry now increases health by 15% (down from 20%), and is no longer available to Protection Warriors. There are a lot of changes coming to CC across the board and Warriors get their share of those changes. The actually CC effects are mainly aimed at PvP, but will carry over into certain other aspects of the game. Other bebuff effects, such as “weakened armor” are also included here. Charge now Roots the target (instead of stunning.) The Root effect does not share a Diminishing Return with other Roots. Safeguard no longer removes movement-impairing effects. Warbringer now causes Charge to stun the target for 1.5 seconds instead of rooting it. 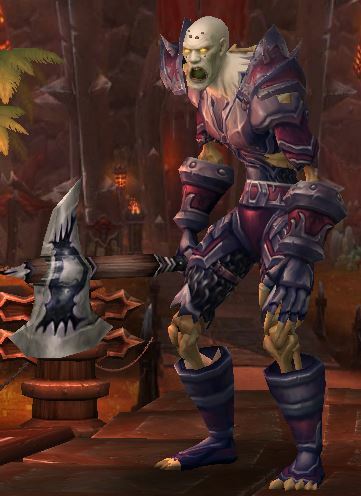 Warrior Stances now once again have their own action bars. Attempting to use an ability that requires a different stance will now automatically switch to that stance. Colossus Smash (now Arms only) now requires Battle Stance. Recklessness now requires Battle Stance. Sweeping Strikes now requires Battle Stance. Shield Barrier is now available for all Warrior specializations (was Protection only) and requires Defensive Stance. For Arms and Fury Warriors, Shield Barrier can be used without a shield. The following changes are intended to bring Arms more into line with what Arms “ought to be.” The cleanup is intended to make Arms more efficient and “deeper,” whatever that might be. Also, since a lot of little strikes doesn’t seem to be appropriate for two-handed weapon use, on a character intended to SMASH!!! things, the mastery has been changed. Removed for Arms: Enrage, Heroic Strike, and Overpower. Arms Warriors should now use Rend and Whirlwind instead. Slam has been changed to a level 45 talent. Rend is a new (brought back from the dead) ability for Arms Warriors. Rend causes bleed damage over 18 seconds, and a final burst of bleed damage when the effect expires. Costs 5 Rage. Arms Warriors now generate Rage from taking auto-attack damage. Each 1% of health taken as damage will generate 1 Rage, up to 5 Rage per hit. Battle Stance for Arms Warriors now generates 115% more Rage from auto-attacks and Critical Strikes now generate double Rage. Defensive Stance for Arms Warriors now generates 50% as much Rage from auto-attacks as in Battle Stance. Colossus Smash now costs 20 Rage and deals 225% increased damage. Execute for Arms Warriors now costs 10 Rage, and consumes up to 30 additional Rage to deal additional damage. Fury Warriors received a few additional changes. In particular, Heroic Strike has been removed for Fury Warriors, and modified Wild Strike to fill the role of quick excess Rage dump. We also made a revision to the Critical Strike chance of Bloodthirst to make them less crit-dependant. A new glyph has been added which gives Fury Warriors a choice for a notably different playstyle. Auto attack damage had become too high, so we also moved some damage from that into Execute (which has been changed to deal damage based on Weapon Damage, instead of just Attack Power.) In order to make sure that you’re able to spend all of your resources within each Colossus Smash window, we added an extension to it onto Raging Blow. Plus, we’ve updated some to spell alerts to improve usability. Bloodthirst now replaces Heroic Strike for Fury Warriors. Wild Strike now has a 0.75 second baseline global cooldown, and costs 45 Rage. Crazed Berserker no longer increases auto attack damage. Instead, it also causes Execute to hit with the off-hand weapon. I also increases all damage by 30% (up from 20%) while using one-handed weapons. Raging Blow now extends the duration of Colossus Smash by 2 seconds, and has a spell alert on the left and right slots. Single-Minded Fury’s effects have been merged into Crazed Berserker. Titan’s Grip’s effects have been merged into Crazed Berserker. Meat Cleaver’s effects have been merged into baseline Whirlwind for Fury Warriors. Piercing Howl is now available to all Fury Warriors as a baseline ability. Vengeance has been removed and replaced with a new passive ability, Resolve. Resolve: This ability adds nothing to DPS, but greatly increases survivability of tanks. It increases self-healing and absorption based on Stamina and damage taken (before avoidance and mitigation) in the last 10 seconds. Without Resolve, Tanks now deal significantly less self-healing and absorption. Resolve has been made much stronger to counteract this, and it increases the amount of self-healing and absorption as appropriate for the fight. Mastery: Critical Block now also passively increases Attack Power by 8% (percentage increased by Mastery), in addition to its current effects. Protection Warriors have received a few notable changes. First, we removed Dodge and Parry from gear, and expect Protection Warriors to value Haste and Critical Strike as important secondary stats. In order to achieve that, we made Riposte give defensive value to Critical Strike. The aforementioned Headlong Rush also helps for valuing Haste. Blood Craze is a new passive ability for Protection Warriors. Blood Craze causes Multistrike auto attacks to trigger a Blood Craze, which regenerates 3% of the Warrior’s health over 3 seconds. When this effect is refreshed, the remaining duration is added to the new effect. Riposte has been redesigned. Riposte now gives the Warrior Parry equal to their Critical Strike bonus from gear. Sword and Board’s effects have been merged into baseline Devastate. Ultimatum’s effects have been merged into baseline Shield Slam. Heroic Throw is now a high-threat ability, generating 300% extra threat, has a 6-second cooldown (down from 30 seconds), but now has a 15 yard minimum range. Shattering Throw no longer reduces the armor of the target; it only does damage and breaks immunities. It also is no longer learned via any specialization, but instead through a new Major Glyph, Glyph of Shattering Throw. A few Warrior talents also were in need of revision. First, Second Wind was problematic; it was sometimes too weak, and sometimes too strong. We chose to change it from a passive health regeneration effect to the new Leech effect, so that low-health Warriors have to maintain combat in order to benefit, instead of kiting, hiding, or otherwise playing defensively. Enraged Regeneration was changed to account for the removal of Enrage from Arms. The level-45 talent row was removed for crowd-control disarmament reasons, and also wanted to allow you to choose more rotational complexity through talents. We replaced the row with new talents, many of which are specialization-specific, giving you a variety of playstyle choices for your Warrior. For the level-60 and level-90 Talent rows, certain combinations were proving problematic. We decided that Stormbolt would better compete with Shockwave and Dragon Roar, and that Bladestorm would better compete with Avatar and Bloodbath, so swapped Stormbolt and Bladestorm’s positions. We also adjusted the effects of a few talents in order to make them more competitive with the talents on their row. Enraged Regeneration now heals for 100% more but the amount healed is no longer increased by being Enraged. Second Wind no longer directly heals the Warrior while active. Instead, Second Wind grants the Warrior 10% Leech while active, which causes the Warrior to heal for 10% of all damage and healing done by the Warrior while active. Staggering Shout has been removed and replaced with 3 new talents that vary by specialization. Arms: Taste for Blood: Each time Rend deals damage, gain 3 Rage. Fury: Furious Strikes: Wild Strike costs 15 less Rage. Protection: Heavy Repercussions: Shield Slam deals 50% additional damage while Shield Block or Shield Charge is active. Piercing Howl has been removed and replaced with a new talent, Sudden Death. Sudden Death causes auto-attack hits to have a 10% chance to make the next Execute free and useable on any target, regardless of health level. These Executes do not consume additional Rage to deal additional damage. Disrupting Shout has been removed and replaced with 3 new talents that vary by specialization. Arms: Slam: Slam an opponent, causing 100% weapon damage. Each consecutive use of Slam increases the damage dealt by 50% and Rage cost by 100%. Requires Battle Stance. Fury: Unquenchable Thirst: Bloodthirst no longer has a cooldown. Protection: Unyielding Strikes: Devastate reduces the cost of Heroic Strike by 6 Rage for 6 seconds, stacking up to 5 times. Once this effect reaches 5 applications, its duration will no longer refresh. Stormbolt is now a level-60 Talent, swapping places with Bladestorm. Dragon Roar’s damage is no longer reduced when hitting more than 1 target. Mass Spell Reflection’s cooldown has been reduced to 30 seconds, but it now replaces Spell Reflection. Talent 1: Anger Management. All specs. Every 15 rage that you spend reduces the remaining cooldown of a number of abilities abilities by 1 sec. Talent 2: Ravager: Throw a whirling axe at a location that does damage to all enemies within 8 yards every 1 second for 10 seconds. Also increases your Parry chance by 30% for the duration. Arms & Fury get Siege Breaker: Slam the target with your weapon and knock him back and down (for 1 sec.) Replaces Intimidating Shout. Protection has Gladiator’s Resolve: Defensive stance damage reduction is improved by 5%. Can choose to go “offensive” by replacing Battle Stance with Gladiator’s Stance. This increases physical damage by 20% and replaces Shield Block with Shield Charge. Raise your shield (a shield is required) and do a short charge towards your opponent. It increases the damage of Shield Slam, Revenge, and Heroic Strike by 30% for 6 seconds. You cannot change in and out of this stance during combat. One of the interesting glyphs changes is automatically learning some as you level. Just like you do with abilities you’ll learn a few glyphs. You still have to install them, as before. The rest can still be bought from friendly (or greedy) scribes and off the Auction House, as always. We all love new glyphs, right? Glyph of Heroic Leap: Increases your speed by 70% for 3 sec after using Heroic Leap. Glyph of Mocking Banner: Your Mocking Banner (Prot only) now causes creatures to attack the tank specialization player you had targeted when placing the Mocking Banner, instead of attacking you. Glyph of Raging Blow: If both of your attacks from a single Raging Blow are critical strikes, then your next Bloodthirst within 10 sec heals for 200% more. Glyph of Rallying Cry: While your Rallying Cry is active, you also gain 20% leech, healing you for 20% of all damage and healing you cause. Glyph of Shattering Throw: Teaches you the ability Shattering Throw: Throws your weapon at the enemy causing 12 damage or removing any invulnerabilities. Glyph of Flawless Defense: You have a 25% reduced chance for attacks against you to be critical strikes while Die by the Sword is active. Instead of receiving new abilities post 90 you will get enhancements to existing abilities. These are your Perks. Also, unlike abilities, they are awarded randomly. At level 95 you might have entirely different perks from that other warrior of the same level and spec, though by level 100 they will all be the same. Perks are learned just like any other ability. Enhanced Rend: Each of your autoattacks causes additional Physical damage from your Rend on the target. Enhanced Sweeping Strikes: now lasts 5 sec longer. Improved Die by the Sword: Increases the damage reduction from Die by the Sword by 10%. Improved Recklessness: +15% Crit chance while Recklessness is active. Enhanced Whirlwind: Whirlwind’s effect to increase Raging Blow targets now grants 2 charges per Whirlwind and can have up to 4 charges. Empowered Execute: Increases the damage of Execute by 20%. Improved Heroic Throw: Heroic Throw no longer has a cooldown. Improved Defensive Stance: Defensive Stance now increases your armor by an additional 5%. Improved Block: Increases your block chance by 10%. Improved Heroic Leap: When you use Heroic Leap, the cooldown of your Taunt is reset. Tank specs (all tank specs) will be somewhat more viable in PvP, come warlords. They’ll still be tough, but will take, and deal, more damage than before. Tanks now take 25% additional damage while engaged in PvP combat. Resilience is dead, increased health pools will make up for that. CC has been changed, see the changes above for details.